Beautiful Blond Woman Close-Up Talking On Phone With Facial Expressions. Beautiful young woman with glasses is talking on the phone. 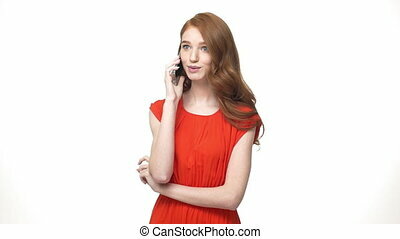 Slow motion young beautiful caucasian woman talking on phone with shyness facial expression. Isolated over white background. Beautiful blond woman goes and talks on the phone in the office. An attractive young person in strict outfit with light skin on face paces space with large green plant and communicates on smartphone. 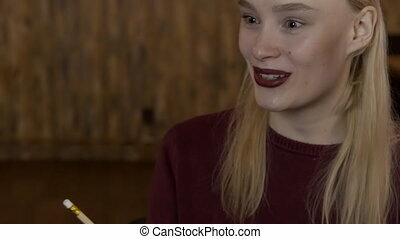 Young blond woman is talking on phone in stylish restaurant, slow motion. Lady in blue shirt and jeans is sitting on velvet chait, at the wooden table in big bright room with glass walls and holding her brand-new smartphone by the hand. Portrait of a charming woman who is talking on the phone. 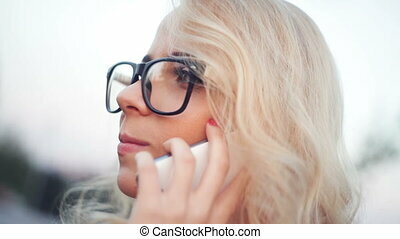 Close-up of female blonde with bright make-up seriously communicates on smartphone that holds in her hands. 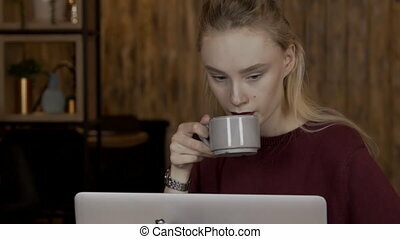 Lonely young blond woman is sitting in a cafe with a phone. Beautiful woman at table and waiting for an order and at same time writing a text message on a smartphone over Internet. Man with phone in hand and woman, talking in company. Female is speaking, gesticulating with arm actively while male partner looks at screen of smartphone carefully. Managers dressed in business clothes work enthusiastically in modern office, sitting at desk on which there is notebook and pens. 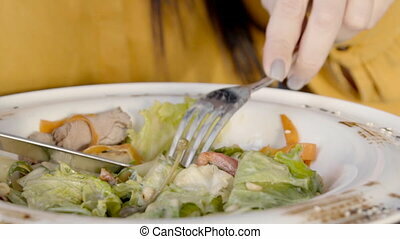 Close-up of woman with a fork and knife eats a salad with meat and vegetables. Female fingers hold steel cutlery, which feeds on a light and low-calorie dish. Close-up of a female eye of green color with beige make-up. 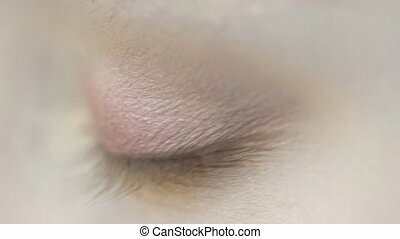 The woman blinks with brass and gentle shadows on her eyelids. Man and a beautiful woman make an order by phone to delivery department. Female blonde model tells her friend about conversation with support service on smartphone. Close-up for two people a waiter on table brings hot coffee and tea. 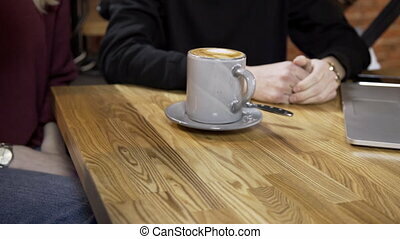 On wooden surface attendants put cup and mug with drinks for visitors who work for laptop. Portrait of beautiful female blonde who is seriously reading the phone. Young woman in a stylish shirt in public place holds smartphone in her hands and reads an SMS with a considerate expression. Man and woman are talking, using smartphone in modern office. Young employees sit at table and look attentively at phone screen, discussing what they saw actively. Attractive blonde dressed in blue classic shirt and partner in suit with tie, communicate with enthusiasm, being located in convenient workspace. 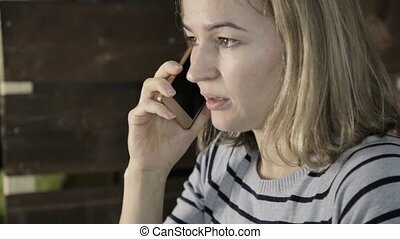 Close up portrait view of woman talking on cell phone. Sitting in office young and beautiful female is using mobile device discussing work questions checking work order and details communicating using wireless connection. She is wearing everyday makeup which is simple and soft, long loose dark hair and blouse of gentle and elegant pink color and cardigan of beige color and golden ring with precious stones on her middle finger of left hand. Close up shooting of woman talking on phone in departure hall. 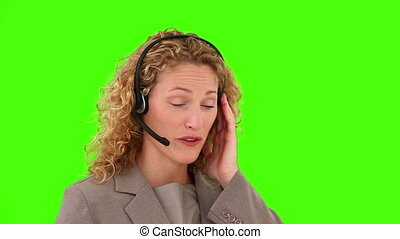 blond short-haired middle-aged female talks on telephone, completes conversation to goodbye. Main focus on passenger in white blouse, black vest speaks by smartphone, preparing for flight, waits for plane, speaking with relatives indoors. Man in suit slowly passes by in space room. On background screen with timetable of aircraft arrivals and departures schedule. Travelling transportation concept. 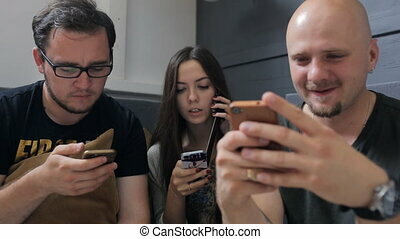 Close up view of people talking and working with cell phone. In photographing studio they are preparing for making compositions. Males and female are sitting on sofa choosing theme and concept discussing photo shoot, creative project talking about details and decorations. Woman is wearing long loose dark hair, and casual loose jumper of beige color, man wearing short black hair, beard, glasses and black t-shirt with funny words, another man has no hair. Close-up shows a young woman with downcast eyes and a slight smile. It has a wide nose, dark wavy hair, pulled back, and light makeup with dark eyebrows and a pink lipstick. One strand of the hairstyle falls to the chin. European woman dressed in a black shirt and dark trousers. The facial expression is calm, balanced, peaceful and contented. One of her legs bent at the knee, as on the other foot, and it unleashes tying shoelaces. Young woman talking on cell, standing near window inside office. Attractive brunette female, in white sweater and black skirt, calls husband, speaking about small victories in career, looking out casement and smiling. Beautiful businesswoman spends free time at work during lunch break with phone in hand, calling to smart colleague for help, explains problem, consults on project issues. On background business center space with modern furniture and white walls. 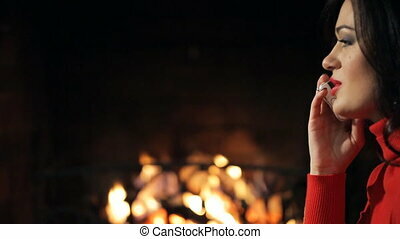 Before burning fireplace girl drinking and talking on the phone. The fire is burning brightly and atmospheric. Drink tea or skin from a white cup and saucer. Caucasian woman has long black hair with a shade, bright makeup with blue shadow and red lipstick, nail polish purple. Dressed in a red sweater. Talks about business partners and friends. Lady smiles, but his expression serious. It's dark in the room. Young woman with blond hair and blue scarf looks directly, shelter from the wind. Touches head arm straightens hair. Model poses for the camera. Preparing for the show. On the face light makeup. Staring at you in the face. A walk down the street without a hat. In the European ladies black fur coat with a hood. Hair develop from a strong wind. The facial expression is calm, serene. Cold weather. Daytime. Advertising cosmetics for face care. 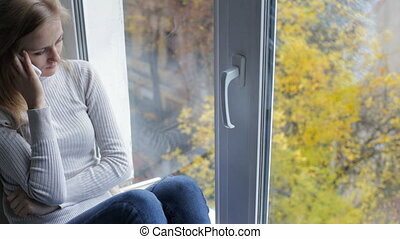 Beautiful blonde woman sits in front of mirror and talks with her friends. She has nice hairdo which is beautified with lovely tail. Female has already applied make-uo on her face and it looks more fresh and attractive. Her lips are painted with bright lipstick, her tone tone is smooth and line of cheekbones is skilfully highlighted with blushes. Pretty lady is dressed in colourful wearing apparel which is decorated with cunning print. It makes her look more creative and intresting. Before a woman with long hair bright colored pareos demonstrated. Female sitting next to other members of the team, in front of her show blue-green scarf with a black border. Subject shaken in the face and squeeze hands. European lady has bared shoulders, blond locks, she holds a hand with a bracelet on her head. When looked textile shawl, then he looked at another object. In the background a window, a vase and a battery. The room is bright and spacious. Two burly women talk to each other and are looking for others. Lady with blond short hair in a purple dress and glasses and squints eyeing. Hands folded on his stomach. European brunette in a dress of orange tones nods, agrees and smiles. Enthusiastically derived discuss the situation around. Something attracts attention. A person opened her mouth and looks into the distance. Beside that something is happening. Loud comments. The room is spacious with two large windows. The windows of the plant.